As another year draws to a close, I pause. Another 12 months have come and gone. Another 365 sunrises and sunsets have lit and darkened the sky above. And here we are. Some of us have experienced great joy and some of us have faced our deepest pain. As I think back on the last year, I am struck that some of my greatest blessings have been born out of the greatest pain. 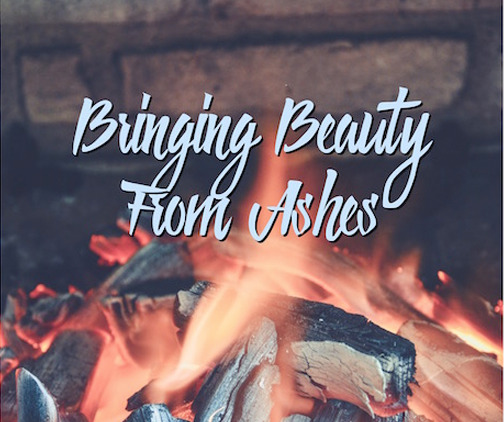 This has been a refining year, a year of peeling away and filing off rough edges to find beauty beneath the ashes. It has been a year to fix my eyes on the horizon of God’s sovereignty and trust that whatever may come, he is good and righteous and holy. It has been a year to bring darkness into light and prune away dry, broken branches that bear no fruit. It has been a year for hard walls of pride to come crumbling down in order to dig deep and rebuild on a humble foundation. It has been a year to cling to prayer instead of judgment. It has been a year to learn to be still when I wanted to act, and listen when I wanted to speak. It has been a year to see messy moments as beautiful opportunities for God’s grace to abound. This year, when disappointment threatened to steal my joy, he whispered I will never leave you or forsake you. When discouragement threatened to rob my peace, he whispered, I am close to the broken hearted. When anger threatened to inflict hurt, he whispered, not your way but mine. When pride tempted me to choose being right over loving well, he gently reminded me that the greatest commandment is love. When insecurity whispered that I am not enough, his whispered that he is enough. When Hope disappeared beneath the weight of weariness, he gently whispered, come to me and I will give you rest. When blessing and busyness threatened to distract me, he was faithful to remind me how much I need him. As this year draws to a close, I am overwhelmed with Thanksgiving for God’s faithfulness in using each messy, heartbreaking, beautiful, imperfect moment to teach me that he is enough, that his grace is made perfect when I am weak and that he will never leave me or forsake me. Dear friend, as this year draws to a close, I want to encourage you, that whether this year has brought great blessing or great pain, or has been unremarkable, God has been with you, loving you, whispering to you and longing for you. As a new year is about to begin, how will you invite him into your messy, heartbreaking, beautiful, imperfect moments? Beautifully written Heather. Thank you. Thank you so much for your encouragement, Mary Ellen! I love this blog, especially where you said, “some of my greatest blessings have been born out of the greatest pain.” I have found this to be true in my life as well. It’s encouraging to know that God is with us in the beautiful AND messy moments of life. Thanks for sharing.